USContraWar is published for all U.S. military members deployed to Honduras and Central America (C.A.) from July 19, 1979 to February 1, 1992, their families and others interested in what U.S. troops were actually doing during the Central America War which includes; the defense of the Nicaraguan Revolution (1979 – 1990) and the correlated Contra War (1981 – 1990), the El Salvadoran civil war (1981 – 1992), the Grenada Rescue Urgent Fury (1983), the Panama Invasion Just Cause (1989 – 1990) and significant terrorist attacks, guerrilla / insurgent war activity throughout Central America. USContraWar is advocating for conflict recognition in the form of an Armed Forces Expeditionary Medal (AFEM) or Central America Campaign Medal (CACM) and the National Defense Service Medal (NDSM) by the United States Government for service during the decade that ended communist advances into the Western Hemisphere allowing democracy to flourish in Central America. At USContraWar you will find extensive information regarding military and terrorist attacks against U.S. troops, citizens and assets in Honduras and throughout the isthmus during the Central America War. The main goal of USContraWar is to petition the U.S. Congress and the Executive Branch to issue an AFEM or CACM, the NDSM, and other combat recognitions for U.S. troops who served in Honduras and Central America during the war ultimately leading to the creation and issuance of the Central America Campaign Medal. Additionally, establish accurate databases of U.S. casualties that occurred and instances where U.S. troops in Honduras and Central America were subjected to hostile fire, explosive devices or conducted offensive operations against the enemy. The proper classification and accurate disclosure of all Americans killed and wounded during the C.A. War remains our top priority. U.S. military members who were deployed to Honduras during the C. A. War do not have these deployments or related awards listed in their official military records. The Executive Branch declared a National Emergency against Nicaraguan on May 1, 1985 which lasted until March 17, 1990 after democratic elections were held in Nicaragua ending the threat to U.S. national security. At least 70 U.S. military members were killed in Honduras or were based in Honduras during the war-which is more U.S. casualties then the Panama Invasion, the Grenada Rescue and El Salvadoran civil war-combined. The Honduras portion of the C.A. War remains the only conflict not recognized by the U.S. Government as a combat zone, therefore no AFEM or NDSM have been issued. Several dozen more U.S. troops were wounded, in Honduras, during attacks by terrorists and foreign military forces operating inside Honduras. Of the 22 U.S. military members killed in El Salvador during the war, at least 12 were based in Honduras including members of the 228th Aviation Regiment LTC David Pickett, CWO4 Daniel Scott and SP4 Earnest Dawson who were killed by communist guerrillas near Lolotique, El Salvador on the return leg of a round-trip flight from Soto Cano Air Base, Honduras to San Salvador, El Salvador when they were shot down. Scott was killed while piloting the helicopter. LTC Pickett and PFC Dawson survived the crash, were captured by the enemy and later executed as wounded Prisoners of War. LTC Pickett was posthumously awarded the POW medal in 2003. It is unclear if SP4 Dawson and his family have yet to be honored with the POW medal. 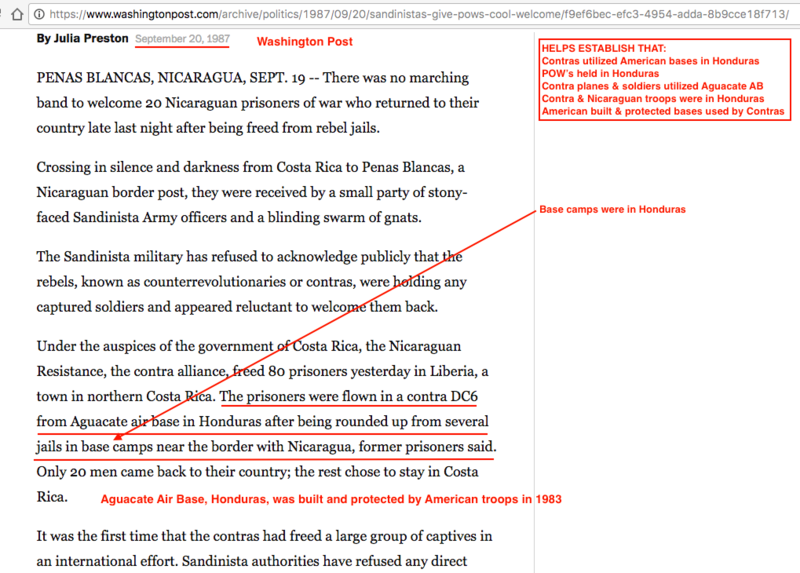 This incident establishes that regular military conventional U.S. combat forces based in Honduras were conducting covert combat missions into neighboring country’s. During the Central America War, more than 300 U.S. troops were killed in the extended theatre of operation. Hundreds of thousands of people died as a direct result of the Central America War. Over 200 documented military and terrorist attacks occurred above or on Honduran territory during the Central America War; many by Nicaraguan communist government troops and El Salvadoran leftist guerrilla forces directed against American troops while operating in a combat role and equipped for combat in Honduras. Hundreds of attacks remain undocumented or secret. More than 300,000 U.S. troops, many equipped for combat with ammunition, were deployed to Honduras during the Central America War to protect U.S. interests and conduct military operations. There was no formal treaty or Congressional mandate authorizing the deployments of U.S. troops equipped for combat to Honduras, therefore, no Congressional combat recognition. During these Executive Branch declared ‘training and war games’ where no combat occurred according to the Pentagon, at least forty-two Purple Hearts were issued to U.S. troops serving in Honduras during the C.A. War period, yet 70 were killed and many dozens more were wounded by hostile fire and explosive devices. For example, on July 13, 1989 in La Cieba, seven Military Policemen of the 549th MP Company, from Panama, were wounded when a bomb was thrown at them while they were crossing a bridge. The MP’s were based out of Palmerola (renamed Soto Cano) Air Base protecting engineers who were on a road building project called Fuertes Caminos. No Purple Hearts were awarded to these seven MP’s wounded during this attack. Many documented and countless more undocumented U.S. troops were subjected to hostile fire, explosive devices and imminent danger yet have not received proper combat honors and recognition by the United States Government. The U.S. Pentagon maintains that U.S. troops deployed to Honduras from 1979 to 1992 were safe; were only training and conducting war games. Honduras was a noncombat area and those U.S. military members deployed under Temporary Duty (TDY) orders do not qualify for combat medals and ribbons according to the U.S. Army Awards and Decorations Branch. Since the Executive Branch proclaimed that Honduras was safe for training, that members were only conducting war games, that no U.S. military members deployed to Honduras participated in combat or combat support missions; those military members deployed to Honduras are not authorized combat medals. In May, 1996, President Clinton signed the National Defense Authorization Act issuing Armed Forces Expeditionary Medals to some 5,000 U.S. troops who served in El Salvador during that portion of the C.A. War where, 22 U.S. troops were killed. During the same period of the El Salvadoran civil war, 63 U.S. troops were killed in Honduras serving during the war. At least 12 of the 22 killed in El Salvador were actually based in Honduras and were sent from Honduras to support combat missions in El Salvador proving a Direct Combat Role of U.S. troops based in Honduras. 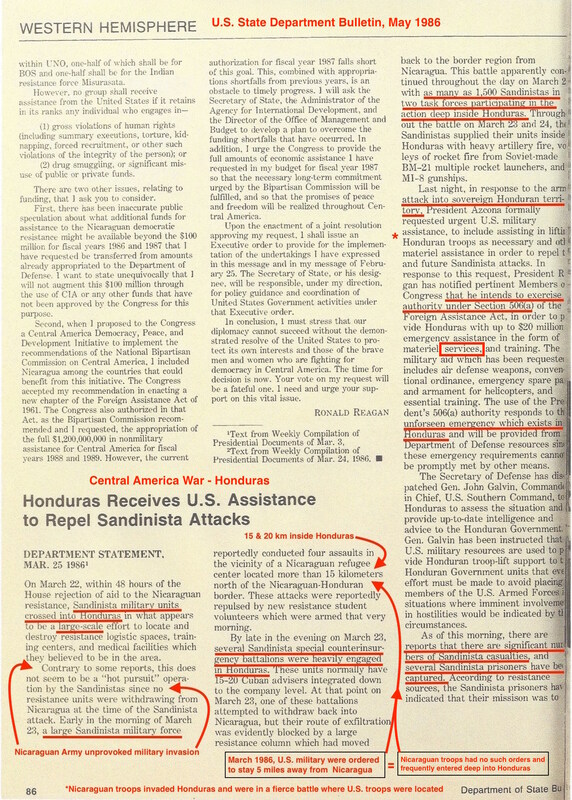 This U.S. Government document establishes that Honduras was an Imminent Danger area! Please donate at GoFundMe to help us get combat recognition. Please help us advocate for recognition as Veterans of this Low-Intensity Conflict by sending a letter to your U.S. Congress or Senate representative in support of our mission by asking Congress to issue an Armed Forces Expeditionary Medal to all U.S. troops who served in Honduras from 1981 to 1992. This will help the families of the killed and wounded, those veterans attempting to receive proper combat honors and recognition for their sacrifices during the decade that ended Soviet communism. WAR? LOW-INTENSITY CONFLICT? IMMINENT DANGER AREA? TELL YOUR REPRESENTATIVE WHAT YOU THINK!